The classic Snake game in 3D. 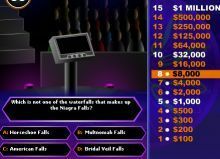 Flash version of the popular TV show Who Wants To Be A Millionaire. Goal of the game is to park cars as perfect as possible. Add the numbers up quickly for better score. Use Arrow keys to guide the ball. Jigsaw puzzle with 25 pieces - there is a nice animation if you complete the jigsaw. Don't play this game if you hate mathematics - you have to Add Like Mad in this game!. Make 3 in a line to remove the tiles; 2 game modes available. Align at least 3 flowers vertically or horizontally..
Collpase clone with bigger play area. See how fast you can return the Cube into its orginal position.. Chess like game featuring cute Blob as the pieces. This game is based on a Chinese puzzle. Your objective is to lead your vehicle to the exit in least move possible. Restore peace by finding the bombs within 20 minutes!. Get all buttons in the up or down position..
Clear all square as quickly as possible. This is more like a simulation than a game. The objective is to create as many chain reactions as possible..
Real time base production war strategy game; Manage the production queue to crush the enemy base. Plan your attacks in this turn based fighting game. 3D Flash Chess with great AI opponent. This is one of the classic puzzle with a new graphic. Get 5 flower of the same kind to be in the same row/column to clear it from garden. This is an online Rubic Cube done in Flash. Try to guess the 5-letter word in as few attempt as possible. Solve the puzzle quickly to earn bonus points. Flash version of the board game. Your mission is to find out the location of enemy fleet and destroy them before they destroy yours. Very similar to the famous Japanese game of Sokoban where you have to puch block into its designated position. Tic Tac Toe - the classic. Remove tiles of the same colour from the conveyer belt. Match all the flower before sunset. Turn all the lights on the board out using the least amount of moves and time as possible. Flash version of the very old Minesweeper game. Beware - this is a really huge jigsaw puzzle! Don't do it if you have appointment later today..
Educative game that make geographic fun; This game is on South America. Choose the angle and power carefully to land safely. Bonus score with combos. This is a crossword puzzle in Flash. Magic ball game with cute pikachu theme. Remake of the classic Shanghai game with excellent tile set. Stop them from attacking each other in the presidential debate. Click on the box to change the targetted box and its surrounding boxes. The objective of this puzzle is to remove all but one marble. To remove marble - jump another marble over it. 4x4 Memory game with Korean style comic. Chinese checker done in Flash. Fujin train Sinjid to fight the Fallen Army. Align 3 or more objects in a line. Move the dropping faces left or right so that the same faces stay together and let them disappear..
Educative game that make geographic fun; This game is on Africa. Connect all the dots with straight line. Match the alphabet to become a word..
Rotate the pipe pieces on the grid board so that the water can reach the exit.. Try not to get the last pearl in this strategy game against the computer AI. Hold the tile and arrange 3 pieces of the same colours to use it. It is 7 versus 6 in this tactical board game of superheroes and their super strength. Return the Rubik Cube to its original position - the same colour tile on each face. The objective of this game is to quickly align 3 or more of objects horizontally or vertically by simply clicking with your mouse..
Snoopy Cilck is a game with its intention to test your memory capability.. Drag the pieces into the grid in this jigsaw puzzle game. Push the eggs into the appropriate nest. Place the happy pill to bounce un-healthy frowns upside down!. Another matching game where you have to match pair of image to clear it from play. Click on the eggs to hatch the monsters. Walking into a minefield - you will have to find the right sequence of moves to escape the minefield safely. This game is similar to Bust-A-Move but it is much tougher to beat. Use the MOUSE to control the direction and power of the squirrel's jump. Move the coffins around and free the Pharaoh. Try to repeat the pattern for as many rounds as possible. A 6x4 Memory game using Cartoon illustration. A clone of the popular Chinese tile game - Mahjongg. This version offer 2 game modes. Remove as many blocks of the same colour in single move will give you higher score!. Move the pile to another location. Click on a number to set the height of the pile..
Shanghai is another name for the classic Chinese game call Mahjongg. Click a peg that can jump over another to an empty space to remove the jumped one..
Its bed time! Turn off all the lights so you can go to sleep.. Explode cubed by clicking on groups of same-colored cubes..